This page includes previous Joining With Juniors columns from the 1999 issues of Across the Fence Post . Media Play, an Appleton retail store that focuses on kids, sells music, software, movies, and books. The manager, David Rucker, a stamp collector of 25 years, has found a way to combine his retail business and his interest in stamps. Dr. Elias Kawar. Kawar offered to donate stamps in support of Stamps for Kids program, and the first event was held in February 1998. It attracted over 75 attendees. First, the kids are allowed to dig through a mountain of stamps. Then Rucker and one of his other employees show the kids how to remove stamps from paper and mount them into homemade albums. Children are also taught about collecting by country and by topic, as well as where to find additional stamps for their collections. Donated perforation gauges are given to the more advanced collectors who are usually amazed to learn that sometimes a difference in perforations may result in a value variant of hundreds of dollars. 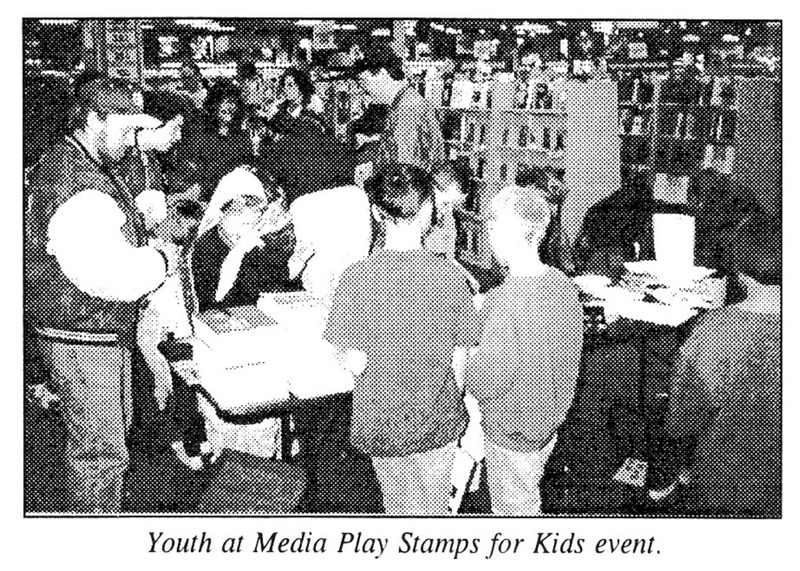 Media Play has sponsored this event several times during the 1998 year and will probably sponsor additional such events when further donations arrive. David Rucker finds that his Stamps for Kids program gives youth an opportunity to talk about stamp collecting with their peers while learning and receiving guidance from educated individuals. He has also discussed forming an actual club with mail correspondence among the members. We wish David Rucker continued success in attracting youth to our wonderful hobby. It was announced at the annual general meeting of the American Philatelic Society at Santa Clara, CA, that the APS staff has developed an outline and some of the details of a new youth program. Tentatively titled the APS All-Star Stamp Club, it is aimed at supporting existing clubs at the elementary and middle school levels. It also encourages the formation of new stamp clubs. The APS will help club advisors by providing them with a quarterly newsletter. The newsletter will include tips from other youth leaders, program ideas, and reproducible pages. In addition, there is discussion about the possibility of setting up a three-tier testing and recognition system with certificates being awarded. The children in the club will receive an APS All-Star Stamp Club membership card, certificate, pin, and a philatelic birthday present. Club leaders are asked to provide members' names, addresses, and birthdays. The information is for the club records only and will not be released. The APS believes they can supplement what the U.S. Postal Service is doing by helping new and existing clubs to have a positive experience in the hobby. By giving the youth a sense of accomplishment, they may want to stay with the hobby and/or return to it once they have gotten beyond their student years. Doris Wilson is the youth coordinator and can be contacted for further information at: APS, P.O. Box 8000, State College, PA 16803. Kids love stories! They also love to have an adult read aloud to them. I have a collection of children's literature that relates directly and indirectly to stamps and/or the stories behind the stamps. Books can be as simple as the colorful "Linn's ABC Book." Each page features one-alphabet letter and a stamp depicting a topic that begins with that letter. To extend the lesson for older collectors, mini lessons and discussions can be centered on some of the stamps used. Commemoratives, definitives, semipostals, and airmails can be identified. Youth can try to find the stamp's value in a catalog. A lesson on foreign stamp identification is possible. There are even a few older stamps sprinkled into the contents of the book allowing for discussion on what makes a stamp a classic stamp or types of printing methods. The Penny Black (Q=Queen) can be a take-off for discussing the first stamp, the initials in the corner, four-margin copies, colored cancellations, etc. Don't underestimate the philatelic knowledge that can be imparted from this alphabet book. As a follow-up activity, have the children create their own stamp alphabet books. More sophisticated collectors may appreciate the retelling of "Alice in Wonderland." Gerald King wrote a philatelic fantasy titled "Alice Through the Pillar-box and What She Found There." Each page is like an album page with first-day covers, postmarks, and special stamps, etc., featuring Alice and the bizarre characters that she meets. For the older child well versed in philately, the play on words are witty. One of my favorite books is "The Jolly Postman or Other People's Letters," by Janet and Allan Ahlberg. The Jolly Postman has a bag of mail that he delivers to well-known and favorite children's book characters. What is so delightful about this book and other similar, books written by this pair, are that as you are reading, you open the envelopes and take out and read the letters as part of the story. Naturally the envelopes are properly addressed, stamped and postmarked. There are many children's books that use letters, postcards and mailmen to help carry out the theme of the story. Likewise there are many nonfiction books that tell the story of mail delivery. One area that should not be overlooked is the beginning biographies - simple to read and well illustrated - that can be used to introduce the people that appear on stamps. The material presented is concise and factual, helping the young collector to recognize the qualities and contributions of the well-known men and women commemorated on stamps. The American Topical Association is celebrating its 50th anniversary at National Topical Stamp Show 99 (NTSS), its annual convention and exhibition. The event will take place July 30 - August 1 in Milwaukee at the Sheraton Four Points Hotel Milwaukee Airport (formerly known as the Grand Milwaukee Hotel). Collecting stamps by topic or theme is a growing area of philately and NTSS is a great place to introduce topical collecting to a young person. There will be exhibits, including some by Wisconsin youth. Dealers will offer colorful stamps and interesting covers. Special activities at the Youth Area will appeal to the interests of visiting youth. To prepare for a visit to the show or to encourage further pursuit of the hobby, youth are invited to create a one-page exhibit for a Way Out Topical Collecting contest sponsored by the ATA in conjunction with its 50th anniversary celebration. The contest is open to any youth under 18 years of age, and entries should illustrate an unusual collecting topic such as beards on stamps, women wearing hats, etc. Youth must prepare and submit a photocopy of one 8'/z-by-ll-inch page of no fewer than six but no more than 12 different stamps and/or other philatelic items. The stamps and other philatelic material must depict a common topic or theme. Pages will be judged on originality, creativity, neatness, balance of material and write-up, eye appeal, condition, and appropriateness of material to fit the topic. Fifty entries will be chosen to receive philatelic prizes awarded in four age categories: 6-8, 9-11, 12-14, and 15-17. Entries should be submitted to: MaryAnn Bowman, ATA Youth Director, P.O. Box 1451, Waukesha, WI 53187. Youth attending National Topical Stamp Show in Milwaukee this summer will have an opportunity to see topical stamp collecting at its best. The youth area will feature hands-on activities that will enable youngsters to learn more about the stamp hobby. Each child will also receive free stamps, covers, and other philatelic-related material. The National Postal Museum's "Create a Postage Stamp" activity and coloring book is one of the items that youths will receive. The 36-page book takes you step-by-step through the stamp design process in an easy-to-under-stand format with activities and illustrations. It then examines printing methods, perforating, inspecting for quality, delivering, and selling the stamps. The Canadian Stamp News has donated a limited number of copies of "Under the Big Top," a stamp activity booklet for kids. This 24-page publication was issued for Stamp Collecting Month last year and features the Canadian Circus stamps. Youth will have the opportunity to create their own one-page exhibits on pre-selected topics. For this activity, youth are given stamps and covers related to a theme. They'll get help in arranging attractive layouts for their pages, and correct mounting techniques will be demonstrated. Build your own bugs? That's what kids will be doing as they design a cachet for the first-day of issue of the upcoming U.S. Postal Service Insects and Spiders stamps. Choosing from among 29 different rubber-stamp bug parts, each child can create one souvenir envelope that will be mailed to them during October Stamp Collecting Month. The ever popular GeoSafari and electric circuit board games will be available. Kids can choose from learning about the stamp collecting hobby and topical collecting fields. Other activities in the planning stages include a scavenger hunt through the exhibits, as well as several new games to help youth learn about various aspects of the hobby and insight into unusual topical trivia. Each child will create a baseball-type cap visor to announce his/her collecting preference. Dealers will know at a glance just what stamp topics interest our young visitors. Details of the American Topical Association's Way-Out Topical Collecting Contest were announced in the April issue of Across the Fence Post. Entries are due by June 30, 1999. For further information, see your April issue (p. 4) or contact me at: P.0, Box 1451, Waukesha, WI 53187. Help a child you know get interested in stamps and topical collecting. Help the child create a one-page Way-Out Topical Collecting Contest entry. Bring the child to National Topical Stamp Show this summer. Computers and youth exhibiting - the topic that sparked the following comments originally appeared in Art Schmitz' "Exhibiting and Judging" column published in the April 1999 issue of ATFP. I have mixed feelings on the subject stemming from my own personal experiences in working with youth exhibitors. (More on that in a future issue.) I was, however, curious to see what others might say. In this, and future ATFP issues, I will share some of the responses received. "Being a computer freak myself, my suggestion is don't! Do not make, or let the kid make exhibit pages on a computer. Sure, it's easy, fun, and time saving, so why not. "It's a matter of keeping the playing field level, as in fairness or today's buzz word justice.' It isn't fair to the competing kids who don't have access to the technology. Good sportsmanship isn't limited to the athletic fields. " "First let me say how fortunate you are to have someone write on the subject of youth exhibiting for your federation journal. That is an enviable position for both the federation and young collectors. And Mr. Schmitz seems to be taking a responsible position in many ways, including insisting that the young person use his or her own words and layout. However I must differ with him when it comes to the use of computers in the preparation of exhibit pages. "I have found that in some cases, the computer is the means to a level playing field. "At one time I was working closely with brothers, both of whom wanted to exhibit thematically. I had led an evening program with their Scout troop and each of them was ready to explore stamps and exhibiting. We worked together for several years. The younger brother had great ideas on how to approach his subject, understood what material to use and worked very hard at his pages. His handwriting was truly poor even at his best, illegible otherwise. He tried using a typewriter but did not like the look and was really getting frustrated with his work. He consistently received bronze-level awards, with an occasional silver-bronze, at national-level shows. His older brother, who also collected and exhibited, had less original approaches and was not careful about the philatelic choices he made regarding material. But the older brother's ability to create an acceptable looking page over-whelmed his brother's thematic ability. He usually received silver-level awards. Then the family bought a computer, as the boys' mother was working on her nursing degree and desired a more efficient manner of data organization. "A major change occurred. The younger boy was finally able to achieve that which his mind saw. The pages he created were neat and clean and they communicated his vision and approach to his chosen subject, Olympic games. His layout was no longer limited by his physical abilities. This young man's exhibit was accepted for Olymphilex 96 in the youth class. He won an international silver-bronze, tying with a fellow American `Olympic Games' exhibitor with far more philatelic experience. It was a great moment for this young man to know he had achieved an Olympic medal for his stamp exhibit. "The younger boy was eventually diagnosed with a vision problem which did not allow him to see images clearly, but rather doubled images when he looked directly at them. The computer definitely evened the playing field for this young man. "While this is a rather dramatic case, the advice to limit a young person's access to a computer when preparing pages, whether for exhibit or for his or her own album, misses the mark in my estimation. These days many library systems have computers, which young and old can access at no expense. They may not have the most sophisticated font or page layout options, but they are available to all. There are many sources, which allow computer access for a fee, such as Kinko's, in addition. Considering that many children have learned to read with computers, used the Internet to research papers (either at school or in the public library), and approach activities more readily when a computer is involved, it seems strange to me to say it is not `fair' to use the computer in philatelic efforts." This series continues with commentary from Ada Prill, director of the American Association of Philatelic Exhibitors Youth Championship. "I have no objection to the use of computers in kids' exhibits. For the young people starting exhibiting now, computers are a tool with which they are both familiar and proficient, often more so than their parents. Many young exhibitors could use a mouse to create graphics long before they could read! "I work with exhibitors as young as eight years old. Many do not yet have the fine motor maturity at that age to create a hand-lettered page that looks neat. Denying them the choice of using a computer just makes the job of laying out pages difficult and unpleasant; in short, their exhibiting is likely to come to a screeching halt. "I don't see that fairness really enters into it. Most children who exhibit do in fact have access to computers, either at home or at school. They should certainly not be downgraded for not using one, but it is a relatively rare occurrence that a kid who prefers to use a computer can't find one to use. My nine-year-old great niece, for example, uses a computer to do book reports and many other school projects, even though her father doesn't own one. Some children have larger allowances than others, which can also be seen as unfair, but each can do whatever (s)he can with what is available. I am really much more concerned with the problem of a few parents putting more money than is appropriate into the child's exhibit. Not only is that unfair to the other kids, it makes the exhibit the parent's project instead of the child's. That should be avoided as best we can. "I certainly don't want to see adults taking over the preparation of a kid's exhibit - or any other aspect of it. The adults should answer questions (or, better, help the child find the answers), give advice or technical information when (if) it is asked for, and praise well-done efforts. But I suspect that there are more kids teaching their parents how to lay out an exhibit page on the computer than the other way around. And if the kids do happen to learn something about computer use in the process of preparing an exhibit, there's nothing wrong with that. use, and chances are that by the third or fourth time Spell-Check rejects a misspelled word, the kid will know how to spell that particular word correctly. Good - a spelling word learned painlessly! No spell checker is going to catch a poorly thought out explanation; that's left to humans. "We can't turn back the clock. Computers are a familiar fact of daily life to our youngsters. Let them use them - or not use them if that's their choice. Like every other aspect of the exhibit, the "how" or preparation should be the young exhibitor's choice, not the choice of an overeager adult." "The function of the parent in exhibiting is to encourage and that means giving praise when earned and making suggestions and presenting alternatives. It does not mean directing, explicit criticism, or doing for the child,"
"Life is not fair and access to a computer is one of the times. Prepare the child for the road, not the road for the child. The real problem here is judges who give too much weight to computerized pages rather than to the ideas and philately shown. Taken to logical extreme, the idea proposed would result in prohibiting better off youth from showing expensive stamps. The concept is unrealistic." "Having tracked this series, I whole-heartedly agree with the positive comments about computer use and have nothing more to add. What I'd like to address, however, is the matter of parental/adult help. "`REMEMBER, ADULT PARTICI-PATION IS TO BE ENCOURAGED!!' This statement appears on the WFSC youth judging sheet. It was added in 1993 as a result of my outrage with a judging experience that occurred at my local club show. Six youngsters had entered exhibits and I had encouraged them to attend the judges' critique lead by two WFSC judges. The result was extremely frustrated parents and kids so distraught that some were in tears. "What happened? Parents were rudely accused of having prepared their kids' exhibits, and I was reprimanded for allowing this practice. Two of the youths were especially singled out for using a computer. At least one of the judges, probably unfamiliar with computers, surmised that only adults could have produced the pages. Wrong! You'll re-call that in the early 1990s computers were more intimidating to adults than to youths. "One parent asked if it was acceptable for him to help his learning-disabled daughter by verbally interpreting information the youngster had located and copied from en-cyclopedias. Judge X replied, `Absolutely no parental help! And this includes so much as touching a computer, typewriter, whatever.' How sad. "I introduced the matter at the next WFSC Executive Board meeting. I argued that I felt it was perfectly acceptable, even if a parent had provided computer help in the form of teaching the fundamentals of a software program or other mechanical operations. Comparable assistance might also be given for use of a typewriter by setting margins, tabs, etc. Many years ago I helped my daughter prepare a handwritten exhibit by providing the manual labor of measuring and drawing fine pencil lines so she could keep her writing straight. 1 didn't consider this to be undue parental assistance, but rather an act of moral support. "How is a child to learn without guidance'? What's the difference if a parent says "I think this page would look better if you moved this here or there," or if a judge says it during a critique at the frames? "Does philately want to alienate parent-child relationships? Shouldn't we be promoting the family values of parents working with children? Are parents to say to their children, `Sorry, I can't help you. Go to your room and do it yourself?' My daughter attended a parochial school where the policy emphatically states that parents are expected to help with their children's homework. Why then must parents step aside when it comes to a stamp exhibit? "To what extent can a club or youth club advisor assist a youngster? My local adult club provides all exhibit supplies: mounts, backing pages, page protectors, and hinges. Is this excessive financial support'? Club members also donate items for youth exhibits when they know of a specific need. Does this mean the child has not searched for his/her own material? "But maybe the child didn't feel quite comfortable about the help and it was the reason she sent me a four-page handwritten document titled `My Report on Bears' - proof that she had done all her own research and the major words that appeared in the exhibit were hers!" Mary Ann Owens, former Wisconsinite and philatelist of international renown, also shared her viewpoints with ATFP readers regarding youth and the use of computers. "These days, there are more kids that know about computers than grown-ups. (In fact, in the New York City school system there are after-school classes for the kids to teach their parents how to use the computer!) No youth should be punished for not using the best tools available to him or her. The use of the computer does not automatically make an exhibitor more proficient in the English language or sentence structure. It might make for less spelling errors for the exhibit text because of SpellCheck but that would be all. "There are very few exhibits at the national level that are hand-lettered and they are practically nonexistent at the international level. They might as well start out early doing it so that it is readable. "At the adult level, no exhibit is down-graded for using the pen, the typewriter, or the computer as long as the judge can readily read the text. Some computer-generated exhibits use a text font so fine that the judges wish that the exhibit had been done on some-thing else. "So it isn't a matter of computer or no computer, it is a matter of providing a text that can be read easily by the judges as well as the viewing public to the capability of the youth preparing the exhibit." "The last time that I judged D...PEX, there were several juniors entered. At the judges' critique we had three little guys and their fathers. The boys were sitting in their chairs as if they were captives in church. The fathers were perched on the front edges of their chairs as if waiting for God to hand them all pots of gold. Easy to tell where the real exhibiting interest was - also easy to tell who pre-pared those exhibits. me to be too tough. My own opinion is that we need to call `em as we see 'em. Maybe I was too harsh. So I won the argument and lost D...PEX as a result. "I was interested to find that Art Schmitz was opposed to the use of computers by juniors. My own feelings are that juniors should be permitted to use any tool (parents excluded) that they can use. My grandchildren (ages 8 and 11) are more computer literate than I am (and no, I don't let either help with my exhibits). "I see a little bit of socialism in Art's `level field' proposal. In reality, this would bring everyone down to an equal datum - mediocrity. The juniors must be expected to grow. Their exhibits must be expected to improve over time. Those exhibits improve by improvement of a number of things --literacy and artistic sense included. If the field were level, there would be no gold or bronze awards. There would be only silvers - silvers for everyone, because we can't let those juniors find a means to improve an exhibit." Although this is the last of the "official" opinions on this matter, I always welcome more. Send your comments to: MaryAnn Bowman, P.O. Box 1451, Waukesha, WI 53187.